Muffled voices. The clickity clack of fingers on a keyboard. The whispers of dusty pages turning on their spines. Children giggling. A faint techno beat buzzing from a pair of earbuds. These are the sounds of a library—that hallowed hall of knowledge and storytelling that makes literary types swoon with nostalgia. Public libraries are designed for people of all ages, yet there’s one group of people who are not immediately drawn to this literary Mecca: teenagers. The Young Adult Library Association (YALSA) has every intention to change that. From school responsibilities and extracurricular activities to entertainment trends and peer relationships, the competition for teenagers’ attention is fierce. Libraries are often the last place a teen wants to be, even though a library may indeed be the best place for them to go. “Teens are one of the most underserved communities across the board,” says Jack Martin, president of YALSA. YALSA, a division of the American Library Association, is a nonprofit association of librarians, library workers, and advocates with the mission to expand and strengthen library services for teens. Beth Yoke, YALSA executive director, says that reading books positively impacts adolescent development by helping teens form their identity and explore their interests. Libraries also provide opportunities for positive interactions with adult role models and play a role in workforce development. 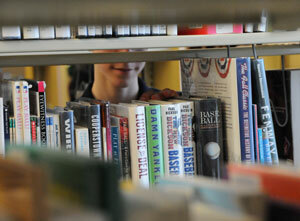 Additionally, Yoke argues that libraries provide a safe place for teens to go after school. How do libraries bridge the gap between what they know to be beneficial to teens and how teens generally view the value of books? “YALSA really seeks to empower librarians by giving them tips, feedback, and building capacity,” says Martin. One way YALSA helps libraries connect to teens is through its annual Teen Tech Week. This year, Teen Tech Week is March 10-16. “Teens’ use of nonprint resources has increased dramatically in recent years, yet more teens are doing this from home instead of the library. Multiple studies have shown that the majority of teens lack the critical thinking skills and technical expertise to use the Internet and other electronic resources effectively,” states the YALSA web page on Teen Tech Week. Teen Tech Week is an opportunity for teens to be reminded that the library is a trusted resource and librarians are experts who can help them develop their technology skills. During Teen Tech Week, YALSA encourages libraries to “throw open their physical and virtual doors” to teens to display their technology offerings, such as e-books, movies, online homework help, and databases. Beyond events like Teen Tech Week, YALSA members have a plethora of virtual resources at their fingertips to help them engage with teens. “We’re not trying to influence what teens read,” says Yoke. Instead, YALSA provides recommendations about teen literature to librarians so librarians can suggest books to teens that will be engaging and relate to teens’ unique interests. The Teens’ Top 10 book list is a great place to start on the YALSA web site. It’s a teens’ choice list from the previous year’s books. Teens read the nominated titles from April to August then vote on their favorite at the end of the summer. YALSA also connects to librarians through Facebook, Twitter, and The Hub, a YALSA blog with ongoing teen literacy information. The content is created by both librarians and teens, but read mostly by librarians and other educators. “We would love for teens to use it,” Yoke says. Another online tool accessible to both librarians and teens is the Teen Book Finder iPhone app. It’s a free download containing five years of recommended reading lists and most-read books for teens. YALSA members can go deeper with professional development opportunities such as webinars, online classes, and events to network with other library professionals and learn new ways for engaging teens at the library. This year, YALSA is conducting a year-long forum to encourage a nationwide conversation about teens and libraries. Yoke describes it as a “virtual town hall” meeting with librarians, schools, youth development experts, and others invested in teen library use. By the end, YALSA will have a blueprint of where libraries need to go—a concrete document to take to congress, policy makers, and libraries. “It’s pretty exciting for us,” says Yoke. Libraries may never win a popularity contest against malls or video game consoles, but YALSA is well on its way to making books more engaging and accessible to teens across America. As literary technology changes, it will be more important than ever for libraries to connect with organizations like YALSA to better connect books and libraries to the teens who need them.